The Donald Trump and Ted Cruz campaigns are working to prevent John Kasich from appearing on the ballot at the Republican National Convention in July, MSNBC has learned, an aggressive strategy suggesting the GOP's leading candidates are girding for a contested convention to select the party's nominee. On Sunday, Trump told a supporter that "Kasich shouldn't be allowed to continue and the RNC shouldn't allow him to continue." If no one clinches the nomination during the primaries, delegates choose from candidates on the convention ballot. 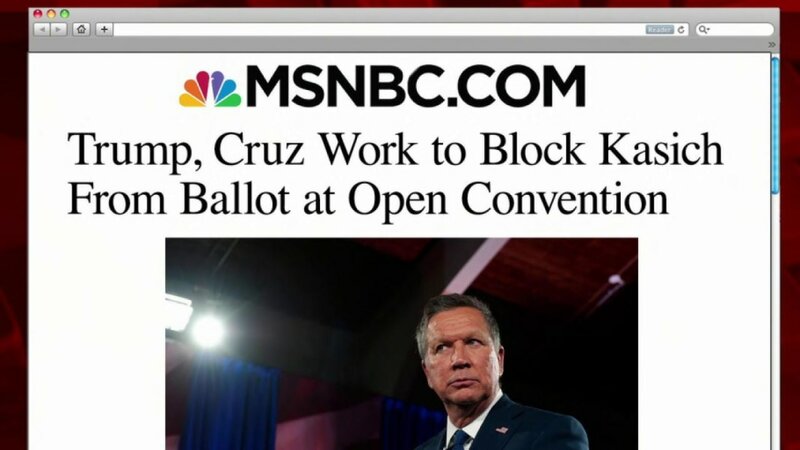 While Trump and Cruz are locked in a bitter battle, aides to both men tell MSNBC it is in their mutual interest to keep Kasich off the ballot. The convention rules control who is on that ballot — and thus eligible to win the nomination. "I expect the Rules Committee to require a level of support that would leave only two candidates on the ballot at the convention," a senior Cruz Campaign aide told MSNBC. That committee, which writes the rules governing an open convention, is made up of 112 Republican delegates from around the country. Operatives for Cruz and Trump say they will have major sway over what the committee does. "The Cruz people and Trump people are fighting hard to make sure their hard-core delegates get on the committee," said Barry Bennett, a Trump adviser. Bennett said a voting bloc favoring the two leading candidates will run the committee. "We'll be successful getting at least a majority — or supermajority," he projected, counting Trump and Cruz delegates together. Kasich cannot mathematically win the nomination through the primaries, so his only hope is to win on a convention ballot. "The committee is not going to oppose" a rule that the two leading campaigns support, Bennett added. Many RNC members now expect the ballot rule to be the first big fight of an open convention, and it will begin when the Rules Committee meets the week beforehand. Another Republican operative, who has worked for Cruz, said the GOP primary will increasingly focus on convention maneuvering, which underscores a cloud now hanging over Kasich's candidacy. "He will have no opportunity to even be voted on," said the former Cruz aide. "The rules will be written in such a way that they can't submit Kasich's name for nomination." The entire issue stems back to the last convention, when backers of Mitt Romney passed a rule requiring a candidate to have a delegate majority in eight states to even get on the convention ballot. Former RNC general counsel Ben Ginsberg, who wrote the rule, said that requirement could potentially block Kasich in Cleveland. "If the campaigns can convince a majority of delegates on the Rules Committee and in the convention, then they can pass an eight-state rule," he told MSNBC. Morton Blackwell, a Cruz supporter who served on rules committees at the last seven national conventions, expects that this year's convention will apply the rule to bar Kasich. "Under the rules, it appears that Kasich can't meet the eight-state threshold," Blackwell told MSNBC. "The rules were established by people who largely are for Kasich right now — the establishment — and changing the rules in the middle of the game is quite generally understood as unfair," Blackwell added, previewing an argument against a rule that would list Kasich on the ballot. While Blackwell supports Cruz, many RNC members view him as a credible rules expert, having twice led the official effort to eliminate the eight-state requirement at RNC meetings before the primary began. Altering the rule now, Blackwell argued, would look like an unfair effort to help certain candidates. Based on the primary results, Blackwell agreed with Trump aides who expect the Rules Committee to be dominated by the two campaigns, and he said that leaves only three players in charge. "There are only two ways that the rules regarding the nomination process can be changed. 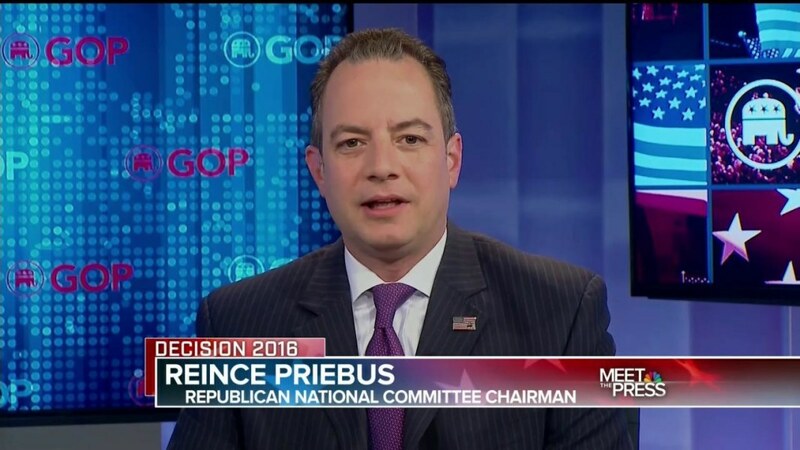 One would be a consensus among all the major players, who are Cruz, Trump and Reince Priebus, if they all agree," he said, referring to the RTNC chairman. "The other way would be after a ferocious rules battle in Cleveland that would split the party." 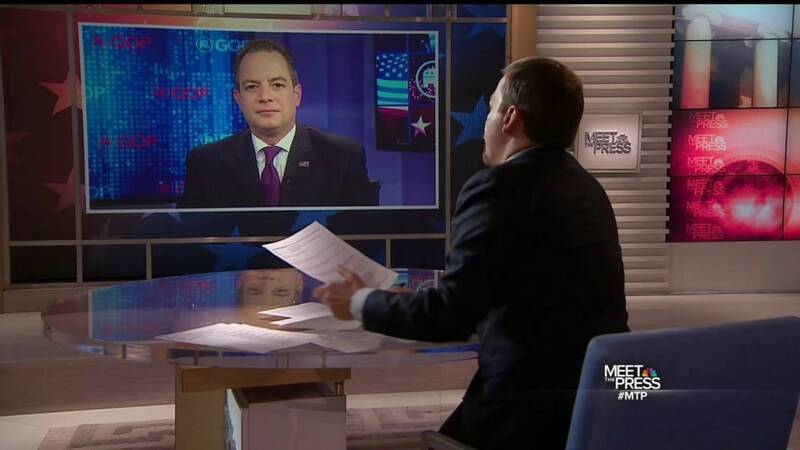 On Sunday, Preibus said on "Meet the Press" that "major changes" to the rules are "unlikely." Blackwell's emphasis on "changing" the rules treats the 2012 ballot requirement as a precedent, while other RNC members stress that every convention has the power to write its own rules. Asked about this effort by the Cruz and Trump campaigns, Kasich aides said they are working to get advocates on the Rules Committee and fully expect to be on the ballot if there's an open convention. "We are working to ensure each campaign has a fair representation on the Rules Committee and it reflects the leadership of the Republican Party," said Andrew Boucher, Kasich's chief convention strategist. Another Kasich campaign aide, who did not want to be named, said the mounting efforts to block Kasich show his strength as a candidate. "Cruz's current push," the staffer said, "shows they're worried about a Kasich scenario at the convention." Kasich rebutted Trump's call for a two-person ballot on Sunday, tweeting, "that's not how our republic works, Donald." Kasich adviser Charlie Black argued that his rivals' ballot maneuvering is actually a messaging effort designed to undercut Kasich in the remaining primaries. 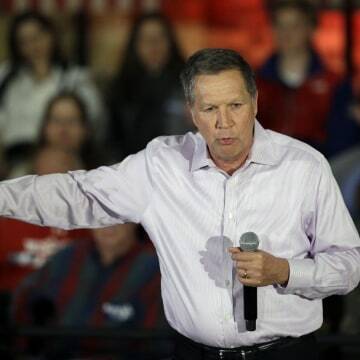 "They're trying to promote that idea to discredit Kasich's campaign," he told MSNBC. "The fact is every convention sets its own rules." Black, whose convention experience spans the Reagan, Bush and McCain campaigns, also questioned both Trump's organizational ability and his competence at divining his own interests in a convention floor fight. "Cruz has done a good job organizing at local level, but Trump has no local supporters that he's going to elect to be delegates to speak of," Black said. The Trump campaign has struggled with delegate selection at state conventions, including this weekend in Tennessee and North Dakota. "If Trump and Cruz wanted to keep Kasich off the ballot, one is making a strategic error," Black added, imagining a floor fight this summer. "They can't both benefit from knocking Kasich." Cruz has the more obvious motivation to remove Kasich, who competes for "anti-Trump" support among primary voters and convention delegates alike. Cruz began making that case directly to voters before Trump. 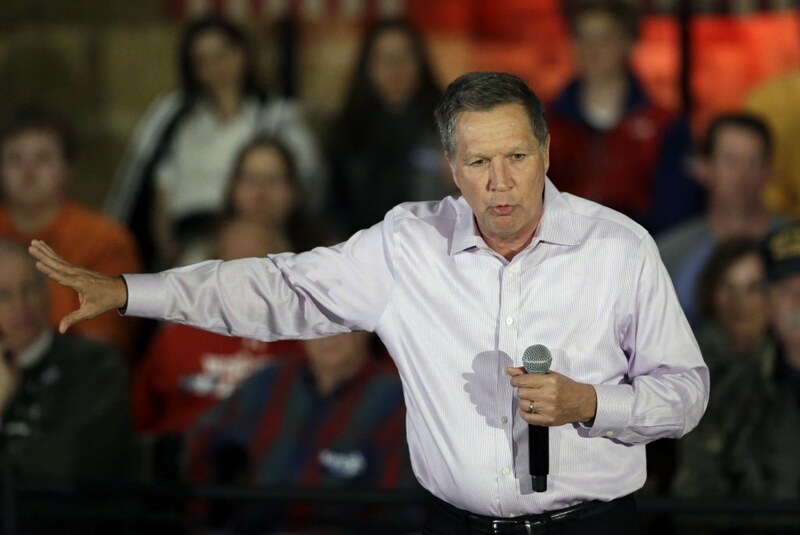 "It's against the rules for Kasich to be on the ballot," he said last week. "Only two candidates meet that threshold." Black could be right that Cruz has more to win in a two-man ballot. The idea is that at an open convention, Trump could benefit by facing extra candidates, who would split his opposition in a rerun of the primaries. According to a Republican familiar with Trump's convention planning, it is actually too early for the campaign to decide on convention rules, because they don't yet know what's "in Trump's best interest." "Who knows if anyone's ever explained to Trump," said the Republican, who supports Trump, "if you remove Kasich, his delegates don't go to Trump — they go to Cruz." On Sunday, Trump suggested a different calculus, saying he told the RNC at a recent meeting that Kasich "goes from place to place" and splits the vote. "In the East, where I'm dominating, he's taking my votes," Trump said, showing a focus on primary strategy. The question for the convention ballot is different, but it is possible Trump would do better in a showdown with Cruz alone. So it is possible Trump's strategy is correct, and his best chance to clinch the nomination would be winning a two-man race on the first ballot. If Trump were short 100 delegates, for example, limiting the options for the delegates up for grabs might push a few more toward him. Trump would not need to win most of those delegates. If both Kasich and Rubio were off the ballot and their campaigns were deemed over, the number of delegates in play could exceed 400. In a scenario in which Trump was down 100, he would only need one 1 of 4 of them. By contrast, after the first ballot, delegates bound to back Trump can switch teams, making his victory less likely on a later ballot. 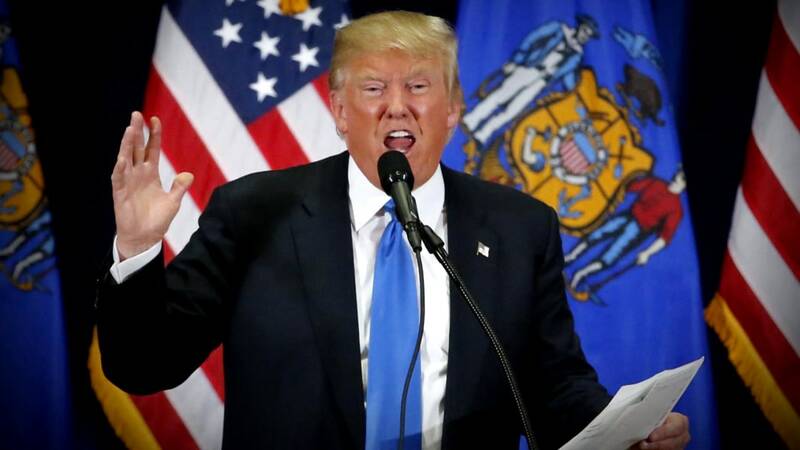 Ultimately, there is no way to project whether Trump's and Cruz's rules strategy will be successful until delegates are chosen at the state level, because those local activists will decide on the rules for the 2016 convention. Party veterans say there is nothing unusual, however, about campaigns' pushing rules to advance their agendas. "It is perfectly understandable that a political team would want to give its candidate an advantage by limiting the convention ballot," said former Texas GOP Chairman Steve Munisteri. "It's political malpractice not to do that." Munisteri, who worked as a Reagan volunteer at the contested convention in 1976, cautioned that at the same time, the party has an interest in showing that the convention "treated losing candidates fairly" to unify for a general election. Complicating matters, there are two other major wrinkles for who gets on the ballot at an open convention. One is good for front-runners, and one is good for underdog challengers. While all the campaigns are working to install their loyalists on the crucial Rules Committee, its rules for the convention must still be affirmed by a majority of delegates on the floor. If those delegates reject the rules package, then the committee can try rewriting them. In the meantime, the convention could start operating "under the temporary rules" from 2012 until new rules are adopted, according to an RNC official. That is bad news for Kasich — even if the floor delegates reject the rules, the default could be the 2012 rule that bars him from the ballot. That scenario has not been tested, however, and some RNC insiders dispute the current party's interpretation that the 2012 rules would automatically kick in. They argue that those rules are designated "temporary" from the last convention and that a new convention must agree on new rules before conducting important business. The other wrinkle is widely misunderstood, but it could prove crucial if there is a long floor fight in Cleveland. The hurdle of requiring delegate majorities in eight states to get on the ballot — Rule 40 — is often counted by citing the delegates that candidates won during primaries. For example, Trump has already won eight delegate majorities and thus qualifies on the first ballot, while Kasich does not. But then things get even more interesting. On later ballots, delegates can support adding a new candidate's name to the ballot. Under the rules, delegates can add a candidate's name to the ballot by presenting the "written support" of a majority of eight states "one hour prior" to the next vote. So even if Rule 40 or a similar rule is applied, a deadlocked convention could usher in new candidates, if they garner written support from those delegates on later ballots. That could include John Kasich. A Kasich campaign aide told MSNBC that while the campaign expects to prevail on rule fights and be on the first ballot, if they were shut out by Rule 40, "anyone can get eight delegations to put their name into nomination." It may be an ominous sign, however, that the Kasich campaign is already exploring that back-up plan. It's a very narrow path. First, most delegates would have to deadlock between Trump and Cruz for one or two rounds of balloting. Then, Kasich would have to organize a surge of supportive delegates to get his name on a later ballot. From there, Kasich would hope to build support as an alternative to an ongoing deadlock. Other potential underdog candidates would face the same challenge — finding enough delegates to add their names to later balloting. Blackwell, the Cruz supporter with extensive Rules Committee experience, said it is conceivable Kasich could use a long floor fight to get on the ballot even if Rule 40 is applied. "If they put hard pressure on it," he told MSNBC, "they might get a majority of delegates from eight states to express a preference." After a primary in which he has failed to build majorities among voters in most states, however, the challenge for Kasich is building enough support among rulemakers and delegates to even be heard at the convention.